作者: Alessandra Bonanomi on 25 October , 2017. Around 5,000 workers distribute more than 200,000 tiffins (Indian English word for the light meal during midday) every workday in Mumbai. Founded in 1890, the Dabbawala service begins with picking up lunches from families’ homes and then delivering them to people’s offices. The service is very cheap (customers pay around $7 to $9 as monthly payments) and highly reliable as there are hardly any delayals or errors in delivery. 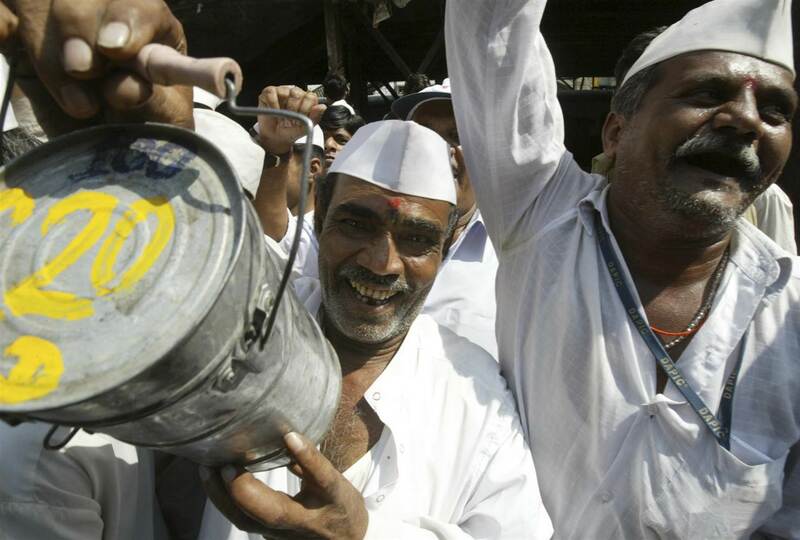 Wearing a white Gandhi cap, a worker picks up a dabba (a cylindrical tin suitable for preserving lunch) from the customer’s home and takes it to the train station. Then, it is transported by train to another station where yet another worker takes it and delivers it to the office just before lunch. In the afternoon, the box is returned to the customer’s house. Lunch boxes are marked with basic symbols: a number in the center that indicates the neighborhood that it is to be delivered, a group of characters that indicate the building and floor, and a combination of colors that indicate the station of origin. Since Dabbawalas are usually workers who have not received an education, this simple system of codes can be understood by all. The Dabbawala is made of approximately 200 units of about 25 persons each. The Dabbawalas manage their work independently as each worker directly negotiates prices with customers and handles acquisitions and any problems that arise. The relationship that is established with clients is based on trust, with no Dabbawala infighting or competition. Why the need for so many lunch deliveries? Apart from the affordable price and efficient service, Indians have many reasons for making use of the Dabbawala delivery system. Because of long commutes, some workers have to leave home very early in the morning. Consequently, often no one is awake at home to make prepare lunch. And even if there is someone to cook the food, it would be cold by lunchtime. Moreover, in the case of India, eating out is costly and the quality of food in many office canteens are below par—not to mention that the majority of Indians who use the Dabbawala service have specific dietary requirements being either vegetarians or vegans. Hindus do not eat beef, Muslims must not eat pork, and Jainists are not allowed to ingest onions, garlic, or potatoes. According to studies, the Dabbawala system has had only 300 to 400 cases of error over 80 million deliveries. This is incredible considering the fact that it is a system mainly managed by non-literate people. Many organizations such as Harvard Business School and FedEx tried to analyze the reason behind such accuracy and the success of Dabbawala deliveries. It seems that firing negligent works and lowering expenditures is not enough for other delivery systems to be as efficient as the Dabbawala. Most credit the accomplishment to Dabbawala workers’ identity. Many of the deliverers come from a region near the city of Pune and share the same cultural roots. “The majority of us belong to a Hindu sect called Varkari, who worship the god Vitthal. We do not eat meat or drink alcohol. One of our most important devotional acts is to give food to people,” said a supervisor of the Mumbai Dabbawala Association to the New York Times. In a melting pot of religions and dialects such as Mumbai, most Dabbawalas share the same language, diet, religion, and culture. Apart from all the important elements mentioned so far, the efficiency of the train system in India is essential for the future of the Dabbawala delivery system. The Tiffin men rely on suburban trains to ensure delivery of lunch boxes. The female condition and gender roles in India also play important parts in the delivery system as most lunch boxes are generally prepared by the women of each household. But as recent trends show more women in the workforce, fewer people will be able to make the food for deliveries. What is more is that there has been a rise in the middle-class ordering takeouts and eating in restaurants. Thanks to the effects of globalization, more people want just the pizza or hamburger. New phone applications permeate the Indian market, but “new technology is for the literate. We Dabbawalas do not know much about technology,” declared a tiffin deliver to the Financial Times. Still, one can only acknowledge the cleverness and efficiency of the Dabbawala system. Its structure includes the poor and allows them to exhibit their full potential; giving them decent work and a satisfactory lifestyle. For all one can know, technology and globalization perhaps could change or destroy the Dabbawala delivery system, but there is an importance to learning the amazing system as it teaches the necessity of social inclusion in the job market. ANOTHER TEST BY NORTH KOREA – HEADING TOWARDS WORLD WAR III?